Now we all know that at the end of the day, the swordbearer’s skill is 90% of what it takes to succeed in HM Crota. The others just feel like their job is just to stand around and shoot rockets periodically; how much effect could we really have? The answer is: quite a lot. I am a regular swordbearer. I patrol the LFG sites on weekends/reset days looking for groups that need a swordbearer. On this past Sunday alone I killed him 10 times. In this time, I’ve been exposed to a lot of groups with a lot of unique ideas, and I’ve had time to play with what works and what doesn’t. So here are some tips and bits of useful information that can help you be a better Crota-killer. EDIT: Some people asked for a link that explains the glitch. Here you go. Do not shoot the glass from inside the crystal room between swords. Yes, I know this lures the swordbearer underneath you, where he is easy to kill. But then the sword drops aaaall the way at the back. If I’m a hunter taking the sword, my invisibility will almost definitely run out by the time I reach Crota. And even if you’re running it with a non-hunter swordbearer, there’s just so much lost time and increased risk that it isn’t worth it. Don’t do it. As a follow-up, Use rockets on the swordbearer. At least some of you, anyway, particularly the ones with heavy ammo boots who can spare a few and still have 4 for Crota (2 per kneel). I can’t tell you how many runs have gone south because the swordbearer has taken too long to kill and then Crota moves before getting a second kneel in. Get that sword down quickly. If you have a titan, use a distraction bubble. Everybody running hard knows about this of course. But something I’ve learned from running over and over is that not all distraction bubbles are the same. The best placement I have seen so far is not where most people place it. 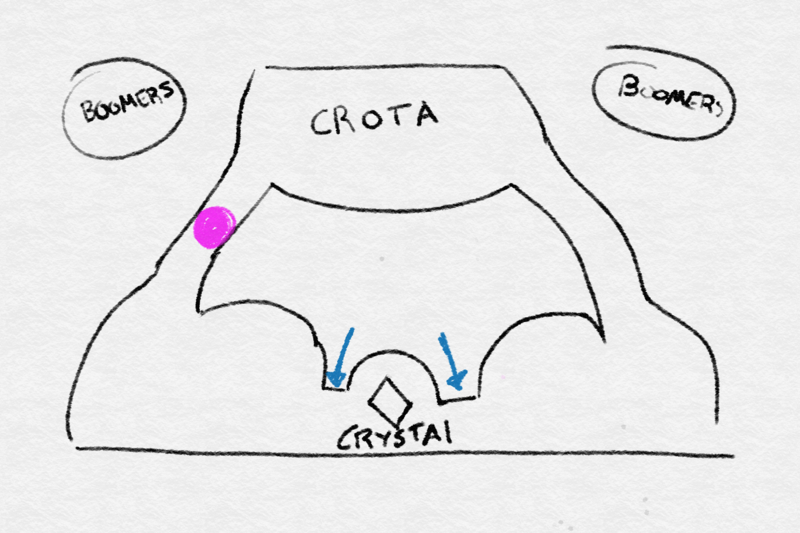 It’s on the bridge on the left side, halfway between the exit door and Crota, crudely drawn in this sketch as a pink/purple blotch (ignore the blue arrows for now). Placing the bubble here catches the attention of the boomers and Crota, making the swordbearer’s job much easier. It also creates a half-way stop with blessing of light, protection, and orbs for the swordbearer, in case I got lit up by boomers/crota while grabbing the sword. EDIT: Some people are saying this isn’t worth it, since another boomer will spawn after a short time. I haven’t played with this particular trick that much actually, the boomers don’t usually give me trouble anyway. So they’re probably right. Kill one boomer on each side right from the start. As long as one boomer is alive, nothing else will spawn. And it’s much harder for one boomer to wreak havoc than two of them. On the third sword, there is a place you can be completely safe from the thralls in the glass behind you. That’s the locations shown by the blue arrows in this sketch. After you down the swordbearer, move to these locations quickly, up against the wall. Down Crota from there, and you’ll be totally safe from both the thralls and the boomers. Once you step on the crystal, your radar disappears. When it reappears, you have exactly 3 seconds until the doors open. This isn’t hugely important, but it can be useful for your awareness. If you run out of rockets, LET YOUR TEAM KNOW. I can’t overstate how important that is. Your team can pick up the slack and fire more rockets or spray primary to get Crota down, but unless you tell them, they aren’t going to. There’s nothing worse than getting Crota one sword-hit away and not killing him because two people ran out of rockets and the others didn’t know to double-down. Any time you are running between locations, JUMP. Boomer shots are not accurate; they’re trying to explode around you, not hit you out of the air. If you jump, you will notice a huge increase in your survivability. Thrall also can’t get you in the air, and cursed thrall can’t explode on you. This is all I can think of for now. If I come up with more, I’ll add them later.